Happy Christmas to everyone in Acocks Green from the Neighbourhood Forum. 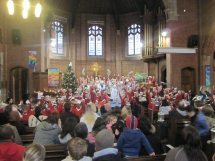 I had the pleasure of attending a Nativity Play on Tuesday 14th, at Acocks Green Baptist Church which was performed by the children of Cottesbrooke Infants School under the direction of the head teacher Mrs. L Allsopp and staff. This event was the forth year of production and showed the children at their very best, all in tune and choreographed to near perfection. The performance and message was uplifting and the children and school should be very proud of their efforts. This entry was posted in Events and tagged Acocks Green, Baptist Church, Cottesbrooke Infant School, nativity play. Bookmark the permalink.